These options depend on the type of column and therefore are not always available. For example, very few options apply to automatic columns. To modify options, click on the column menu in the column’s header, then choose "Settings" in the menu. The column settings page lets you edit the options available for that column. On the screen above, you also have access to options to modify the behavior of the columns. For example, you can make data entry mandatory in a column, specify a default value, hide a column or make it read only, require user to enter a different value for each row or add constraints on numerical values (e.g. minimum and maximum value, number of digits displayed after the decimal point). You can describe your columns to make your tables more readable and easier to understand for your users. To do so, edit the subtitle or description attribute. The Tooltip of a column is shown when hovering over the column header. A Question Mark indicates that such a Tooltip is available. 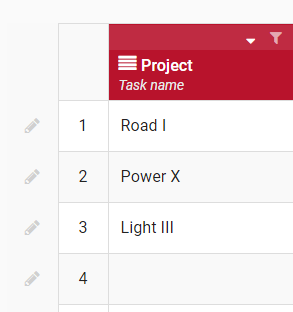 Both attributes describe your columns and facilitate data entry into your tables by the contributors. The Column Settings page also lets you specify the type of data you expect in each column. Choose text, date, numbers, comments, formulas... to guide and restrict data entry at the same time. Click here to learn more about our data types. 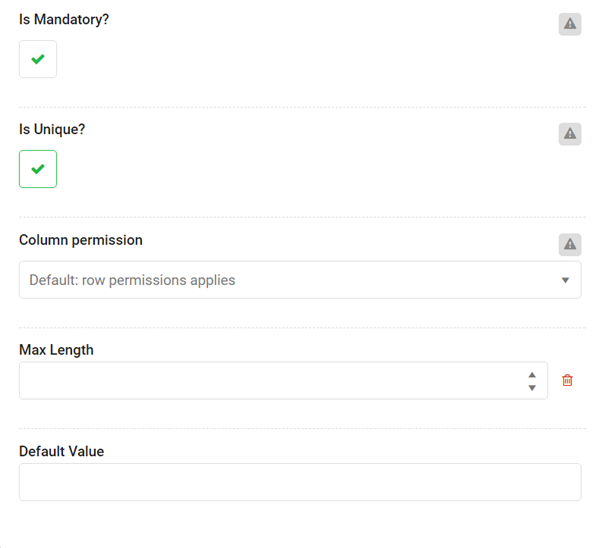 On top of RowShare advanced row-based permissions system, you can set rights on columns. If you don't, by default, row permissions apply to determine if a given user can see and/or write a row. You can set a column as hidden or read-only. Column is hidden for contributors: The column is hidden for all users of the table except the table owner(s). When this option is activated a specific icon will appear next to the column name as shown below. Only RowShare Business tables can have more than one owner. 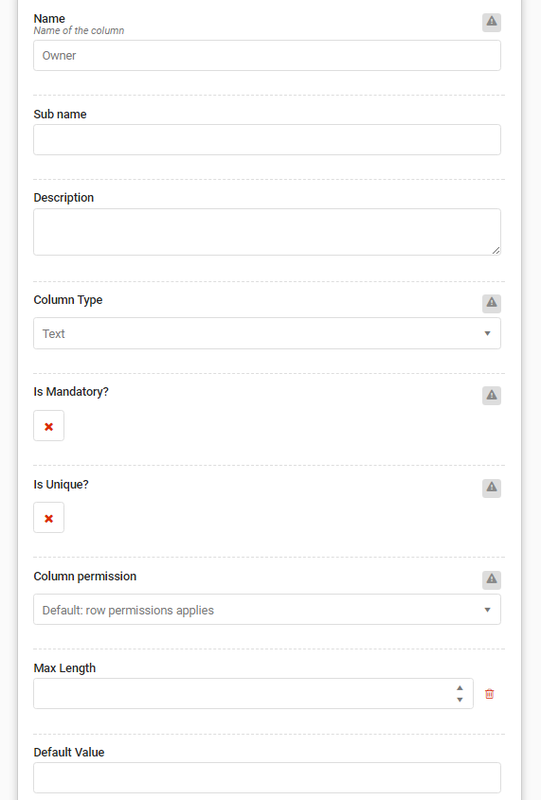 Column is readonly for contributors: The column can be modified only by table owner(s). Other will see that column as read-only. When this option is activated a Lock icon will appear next to the column name. 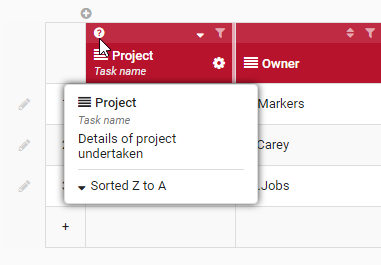 Only RowShare Business tables can have more than one owner. The most commonly used setting is to set a column as mandatory. When this option is activated, the cell has to be filled or the row will not be saved. The user will have visual guidance to understand that this column has to be filled in order to validate the row. If this option is activated, two rows can not have the same value in that column. When creating a new row, or resetting a cell value, the Default Value is entered automatically. The user can then override or delete it. These options are not available for other column types. For Money columns, you can choose the currency used. 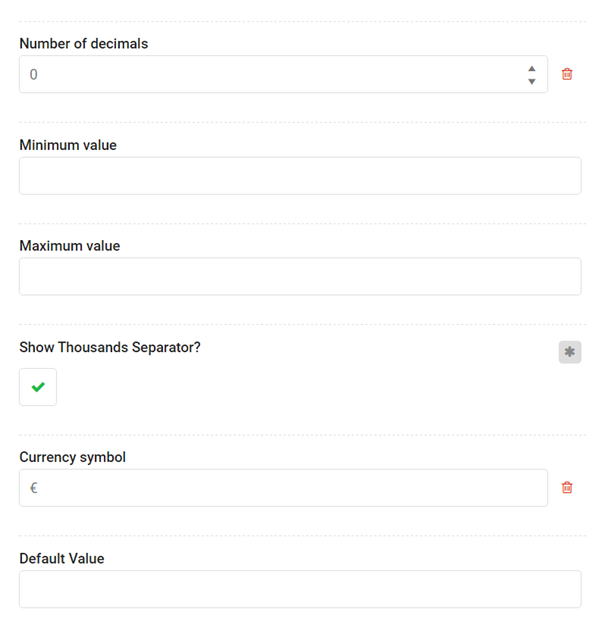 The default currency depends on your table's language, that in turn is set by default according to your user profile. For example, if your table is in French (France) then the default currency will be € (Euro).